Moira McKibben has been recognized by the Ontario School Bus Association with the Driver Excellence Award for 2016. The Switzer-Carty Transportation driver was honoured the award to reflect performance in the areas of customer service and safe driving. At the October 27, 2016 Ontario Association of School Business Officials Transportation Conference in Collingwood, the Ontario School Bus Association held awards recognizing driver excellence. 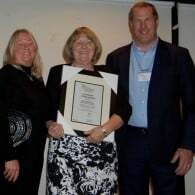 Moira McKibben, of Switzer-Carty Transportation’s Mississauga location, was honoured with the 2016 Ontario School Bus Driver Excellence Recognition Award. The award recognizes Ontario school bus drivers who have demonstrated exemplary performance and a commitment to excellence, particularly in the areas of driving, customer service and safety. “We are honoured that Moira McKibben from our Wolfedale Branch in Mississauga was chosen as this year’s recipient of the award” said Jim Switzer, CEO and President of Switzer-Carty Transportation. The school board transportation department in Peel Region praised Moira for what they learned was a wonderful act of kindness for one of her students and his Grandmother who is his caregiver. She donated a meal so that a family in need and struggling would have a wonderful Thanksgiving Dinner. Upon receiving the gift of kindness, the Grandmother phoned the school in tears to express her thankfulness and gratitude for the wonderful meal and her appreciation to have such a wonderful caring person in their lives such as Moira. “We are proud to have Moira representing Switzer-Carty Transpiration each and every day….her kind, caring and generous nature is amazing” said Switzer, who attended the presentation gala. Switzer-Carty Transportation operates school bus and coach rental bus services across the Southern Ontario and provides ongoing safety and customer service training to all drivers. Would you like to join the Team of great drivers at Switzer-Carty Transportation? Apply now!